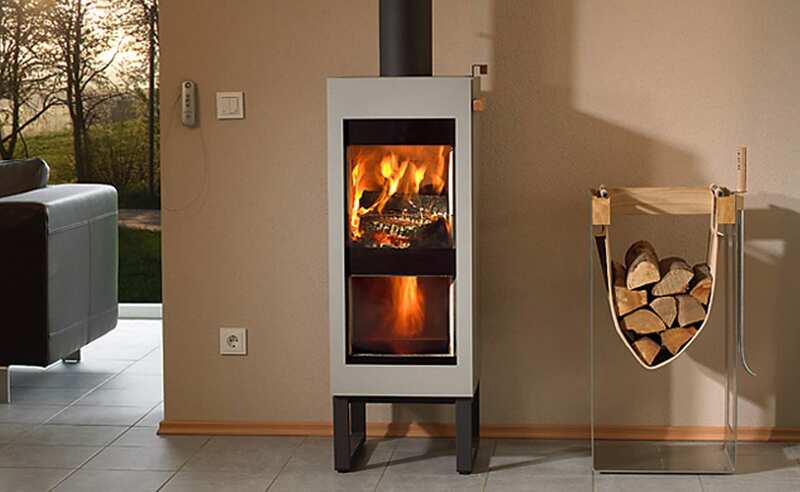 Originally designed by two German Engineers as a way to provide an efficient burning method and minimize pollution in third world countries, the Twinfire® has a life of its own as a remarkable, hand-made wood burning product that more than exceeds industry standards. 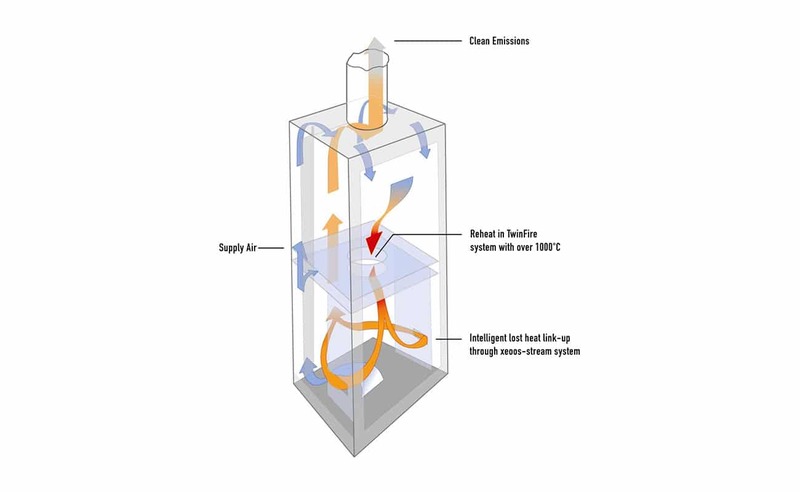 All Twinfire models utilize the unique double-chamber combustion system (see diagram at left) for effective (a remarkable 93% efficient), environmentally friendly wood burning capacity and are EPA certified and approved to UL/ULC standards. 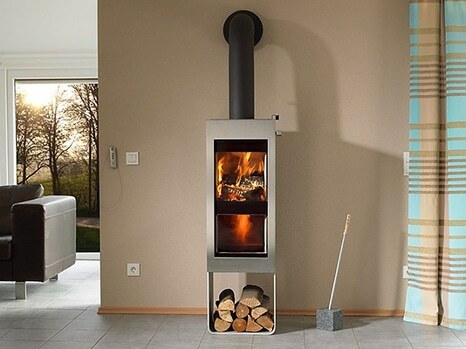 Add this remarkable stove to a living space as an efficient, green alternative. Truly, the Twinfire is a fascination and joy to own and operate. 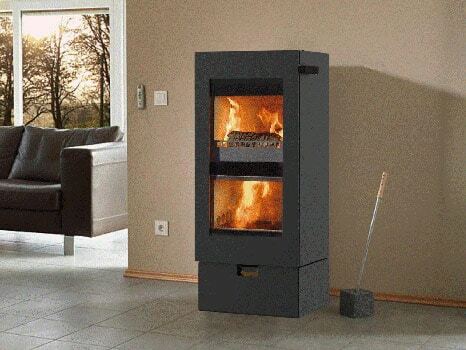 Manufactured in Germany, the xeeos Twinfire® utilizes high quality materials. Special attention to details such as the thermally decoupled silicone handle, the uniquely shaped grate, and the optional lower steel gate (shown at left) have created an award winning product (see some of the prestigious awards below). The Twinfire series come in five models: Solo, Basic, Classic, Elegance, and Pur. The Solo is available in matte black steel from top to bottom. 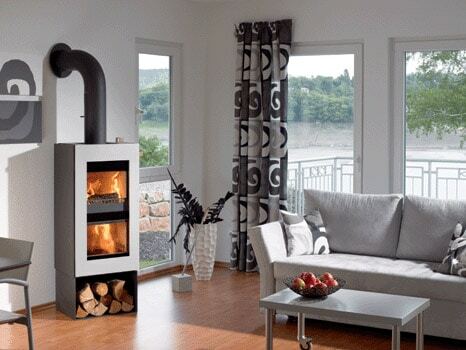 Its minimalism and simple beauty gives it an ultra contemporary look, which is perfect for homes that seek super modern flair in a wood burning stove. The Twinfire Solo measures 44” high, 18” wide, and 16” deep. Underneath is a drawer for storage. It weighs about 470 lbs. Heats up to 41,000 BTUs; over 1,000 square feet. Top or back vented. The Basic is available in silver, black or stainless steel with additional optional color steel sides in ruby, copper, or bronze. The Twinfire Basic measures 48” high, 18” wide, and 16” deep. Underneath is a drawer for storage. It weighs about 470 lbs. depending on the cladding. Heats up to 41,000 BTUs; over 1,000 square feet. Top or back vented. 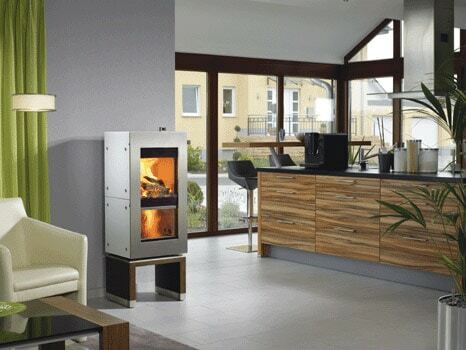 The impressive Twinfire Classic has a stainless steel door with lava stone cladding. The front of the bottom storage drawer is black glass. Options are top plates in silver or black or sides in trachite stone. It is 52” high, 22” wide, and 16” deep. The Twinfire Classic weighs about 640 lbs. depending on the cladding. Heats up to 41,000 BTUs; over 1,000 square feet. Top or back vented. The chic Elegance is available with black glass sides, lava stone top plate, and a stainless steel door. Other options include stainless steel sides, trachite stone top plate, and with base and handle choices either in natural or dark brown wood. It measures 50” high, 19” wide, and 16” deep and weighs about 350 pounds. 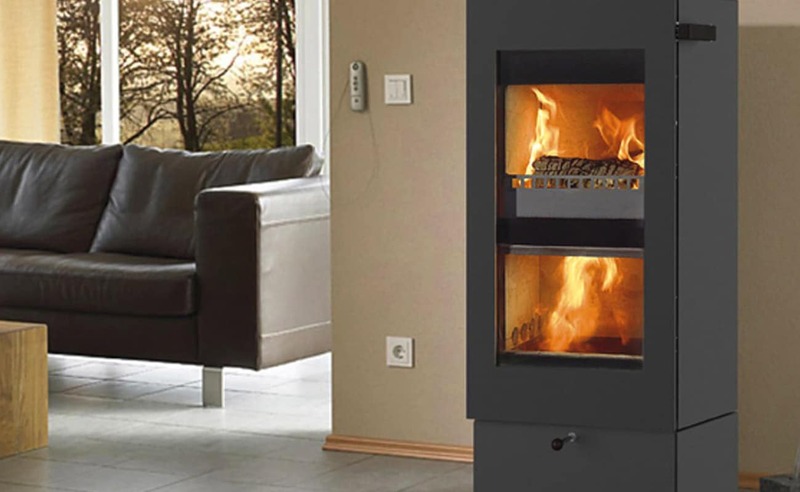 The Twinfire Elegance heats up to 41,000 BTUs; over 1,000 square feet. Top or back vented. The exotic Pur with its futuristic look comes with black glass and aluminum side panels, a stainless steel door, and a lava stone top plate. Optional top plates are available in silver or black steel. It measures 51” high, 19” wide, and 16” deep andweighs about 515 pounds. 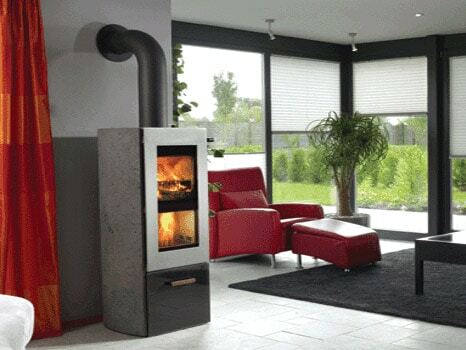 The Twinfire Pur heats up to 41,000 BTUs; over 1,000 square feet. Top or back vented.